Raj was an awesome asset to our team generating excellent ideas and presentations. He's a great communicator, very easy to work with and consistently puts in every effort to work equally with everyone on his team. Anyone who gets a chance to work with Raj is going to benefit hugely from his amazing skills, energy and positive attitude. Helena Jeeves Eightfold Logic, Inc. 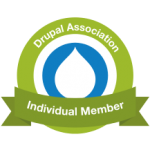 Considering all of the upgrades, repairs and maintenance that you've done since the implementation of our first Drupal website [years ago], this is a tribute not only to your expertise, but also to your relationship with us. The website has continued to develop in ways we didn't even imagine were possible when we first started out. The ongoing service that you provide is immense...... and we're immensely grateful. Just wanted to thank you again for all your help. You don't know what it means to me to have the help of a reliable programmer. The fact that you accomplished this project within a week of my original request, in spite of your very busy schedule AND your birthday, is very impressive. You think "outside the box", suggesting security and software updates that I had not considered, but which I know are incredibly important! Setting up an automated regular database is golden! I will recommend your services to everyone in my little web design community. I was referred to Raj by a friend, as I wanted to develop a website for the notary division of my Brosgall Legal law practice. From start to finish, the entire process went really smoothly, and I am really pleased with the functional and aesthetic finished product. Raj created a beautiful modern design, and the CMS is a breeze to work with. Raj is both very knowledgeable, and easy to work with. Highly recommended!